Stanford energy experts have released a study that compares the experiences of three large economies in ramping up renewable energy deployment and concludes that renewables can make a major and increasingly cost-effective contribution to climate change mitigation. The report from Stanford's Steyer-Taylor Center for Energy Policy and Finance analyzes the experiences of Germany, California and Texas, the world's fourth, eighth and 12th largest economies, respectively. It found, among other things, that Germany, which gets about half as much sunshine as California and Texas, nevertheless generates electricity from solar installations at a cost comparable to that of Texas and only slightly higher than in California. The report was released in time for the United Nations Climate Change Conference that started this week, where international leaders are gathering to discuss strategies to deal with global warming, including massive scale-ups of renewable energy. "As policymakers from around the world gather for the climate negotiations in Paris, our report draws on the experiences of three leaders in renewable-energy deployment to shed light on some of the most prominent and controversial themes in the global renewables debate," said Dan Reicher, executive director of the Steyer-Taylor Center, which is a joint center between Stanford Law School and Stanford Graduate School of Business. Reicher also is interim president and chief executive officer of the American Council on Renewable Energy. "Our findings suggest that renewable energy has entered the mainstream and is ready to play a leading role in mitigating global climate change," said Felix Mormann, associate professor of law at the University of Miami, faculty fellow at the Steyer-Taylor Center and lead author of the report. Germany's success in deploying renewable energy at scale is due largely to favorable treatment of "soft cost" factors such as financing, permitting, installation and grid access. This approach has allowed the renewable energy policies of some countries to deliver up to four times the average deployment of other countries, despite offering only half the financial incentives. Contrary to widespread concern, a higher share of renewables does not automatically translate to higher electricity bills for ratepayers. While Germany's residential electric rates are two to three times those of California and Texas, this price differential is only partly due to Germany's subsidies for renewables. The average German household's electricity bill is, in fact, lower than in Texas and only slightly higher than in California, partly as a result of energy-efficiency efforts in German homes. An increase in the share of intermittent solar and wind power need not jeopardize the stability of the electric grid. From 2006 to 2013, Germany tripled the amount of electricity generated from solar and wind to a market share of 26 percent, while managing to reduce average annual outage times for electricity customers in its grid from an already impressive 22 minutes to just 15 minutes. During that same period, California tripled the amount of electricity produced from solar and wind to a joint market share of 8 percent and reduced its outage times from more than 100 minutes to less than 90 minutes. However, Texas increased its outage times from 92 minutes to 128 minutes after ramping up its wind-generated electricity sixfold to a market share of 10 percent. The study may inform the energy debate in the United States, where expanding the nation's renewable energy infrastructure is a top priority of the Obama administration and the subject of debate among presidential candidates. The current share of renewables in U.S. electricity generation is 14 percent – half that of Germany. 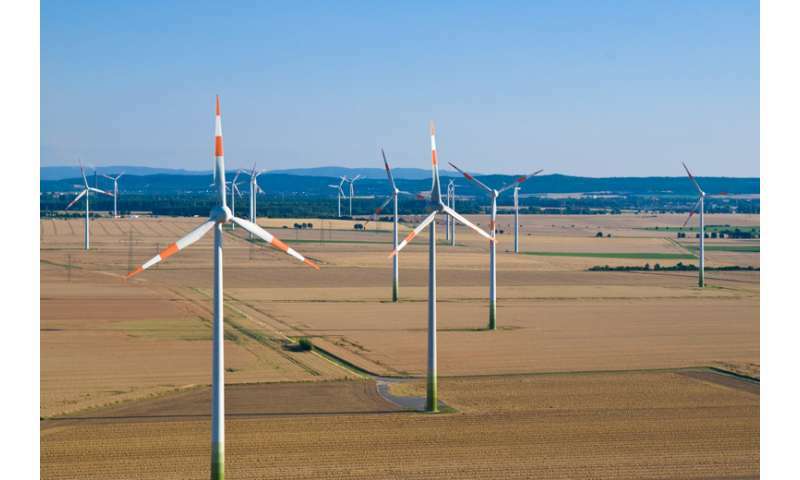 Germany's ambitious – and controversial – Energiewende (Energy Transition) initiative commits the country to meeting 80 percent of its electricity needs with renewables by 2050. In the United States, 29 states, including California and Texas, have set mandatory targets for renewable energy. In California, Gov. Jerry Brown recently signed legislation committing the state to producing 50 percent of its electricity from renewables by 2030. Texas, the leading U.S. state for wind development, set a mandate of 10,000 megawatts of renewable energy capacity by 2025, but reached this target 15 years ahead of schedule and now generates over 10 percent of the state's electricity from wind alone. How smart can the electricity grid be? Germany, which gets about half as much sunshine as California and Texas, nevertheless generates electricity from solar installations at a cost comparable to that of Texas and only slightly higher than in California. What they don't mention is the fact that the cost of it is truly ridiculous. Out of all the subsidized forms of energy, solar power in Germany produces the least energy per euro paid - aside for the truly marginal forms such as wave energy. At the peak the German direct feed-in-tariff to solar power was a whopping 90 cents a kWh guaranteed for 20 years, now down to about 20 cents (21.15 cent USD) for the new installations. The whole industry in Germany is winding down because the government is threatening to stop subsidies to new solar installations. Once that happens, it becomes impossible to build more solar power since the previously installed and still subsidized panels are pushing out power at near zero prices when you're trying to sell yours. Really? I would have thought it's lower. Last power outage I can remember was 20 years ago (and I only noticed that one because the VCR was flashing when I woke up in the morning). Out of all the subsidized forms of energy, solar power in Germany produces the least energy per euro paid - aside for the truly marginal forms such as wave energy. "Not really. A study by Fraunhofer institute found that if you add all the subsidies for fossil/nuclear you find that they are subsidized at roughly triple of what renewable energies get..."
There is one major problem with that type of study which is how do you define "subsidy" and how the heath costs are calculated. Most of the so called subsidies are nothing but tax breaks that are available to all corporations. As far as nuclear waste disposal goes it all should be stored in a few central locations world wide but of course that will never happen because only solutions that will be safe for 50,000 years will be considered. Don't blame the nuclear industry for political storage problems. There is still a lot of energy left in these wastes and I can see them being part of the solution to our energy needs in the not too distant future if the pandering politicians get their act together. I have never seen a proposed government program yet that did not save 100s of Billions in health care costs and extend the average life by years. Huuummm, we should all be living to 150 by now and health care costs should be decreasing. There is one major problem with that type of study which is how do you define "subsidy"
Hwo would you define it? I'd see it as any money that is handed to a producer above and beyond what they earn from selling their product. This includes such things as having taxpayers pay for cleanup, waste storage to such things as increased costs to health systems. Don't blame the nuclear industry for political storage problems. You mean operators should not have to care about the waste they produce? Really? You apply that sort of 'logic' to all types of companies? Nuclear Power was initially subsidized (and still is to some extent) but for the past few decades has been penalized more far heavily than subsidized. Coal's more recent subsidies have simply taken the form of ignoring the true cost of using that energy source, both in the recovery of coal and in the burning of coal. "Clean coal" technologies (gasification, etc...) address some of the after recovery issues, but really none of the recovery issues. Considering the time and cost required to engineer and license any new Nuclear technology, and the pace of development of other technologies, not many are choosing investment in Nuclear right now. To start the process of engineering & design, followed by certification, sale, build & license, takes so long that the entire technology is in danger of being overtaken by developmental events. Of course, the changing climate has a very likely underestimated capacity to include events than can overtake a great many things. Exactly what are the true health costs of fossil energy? We are all dying from chronic conditions like heart disease, diabetes, and various, other than lung, cancers. Most of these are caused by old age and not pollution. We are living much longer today DUE to the benefits of fossil and nuclear energy. I look forward to the day that renewables can totally displace our finite supply of fossil but that time is not now because they are still too costly. That is why they push these studies that try to add unreal costs to fossil energy in order to make renewals seem more reasonable. As far as the cost of a nuclear disaster goes that is a problem. There are new reactor technologies that can greatly reduce the risks involved to very safe levels. These need to be considered as an interim solution. When we can store electrical energy at say 1 cent/KWH and the true lifespans of wind and solar equipment are known renewables will become much more of a realistic replacement. There is nothing more unreliable than the "lives saved" statistic. Say I am drowning in a pool and am saved by the lifeguard. Say I return tomorrow and get saved again. Did the lifeguard save one or two lives? The same thing applies to most of these lives saved statistics, at risk people are counted multiple times. If someone who was "on their death bed" dies during a heatwave did global warming "kill" them. My favorite misuse of statistics was the claim that smoking raises healthcare costs. This is blatantly untrue. People who smoke die at a much younger age and usually from fast acting diseases like heart attacks. Whereas non-smokers can live a much longer time with costly chronic diseases. If you buy this crap, then I got a nice bridge to sell you. Onions I will forgive your ignorance on the matter since you are not from the US. The US government sued the tobacco companies and obtained a 200 billion dollar settlement based on increased healthcare costs. Onions you do not have to be a rocket scientist to understand that most of the developed world's economy is based on the replacement of human labor by cheap energy. Increase the cost of energy and the cost of everything increases creating more poverty. Poverty increases the death rate. Give it up guys, we can't burn fossil fuels forever. Yeah, they made the life we have today possible, but that doesn't justify using them forever, times have changed. We don't have to use fossil fuels at historically comparable levels anymore, and we really can't. We can split atoms and directly use sunlight now. Wind power creates a lot of jobs too. Cheap energy doesn't have to be about increasing supply, you can also be about reducing demand. As the article mentions, Germany was able to keep energy prices comparable to prices in the US by emphasizing efficiency, good windows and what not. We can create more jobs through a larger variety of industries through reducing demand. It's a surprisingly effective program (and about 30 other countries are looking using it as a model for their own restructuring effort). The rebates given for better insulation was great for craftsmen and homeowners alike. Insulation is something many homeowners wanted to do anyways given the spikes in oil prices in recent years - but with the rebates it became affordable enough to pay for itself within 2-5 years. Why would anybody want to burden us with grossly-expensive and dangerous nuclear power at 13 cents, when they can get clean power, with no radioactive waste for three to four cents/kWh? Who wants to burden the poor here? Antialias, your claims are inaccurate. German electricity rates only began rising when the renewable energy push began. It is the cost of renewables that drove up German energy costs. Moreover, Fraunhofer is not a neutral source of analysis. It is a company with vested interest in renewable energy. If German solar power is such a good fit for Germany, why is so much exported (hint: bad fit) and why is the utilization rate of German solar plant less than 10% per annum? Gkam, I prefer nuclear because it has proven track record at reducing per capita CO2 emissions. The developed countries having the lower per capita CO2 emissions are France, Sweden, and Switzerland, not Germany and Denmark. And by the way, the fully loaded costs are not 3 to 4 center per kilowatt.
" . . it has proven track record at reducing per capita CO2 emissions"
It does? Are you aware of the cost in fossil fuels and money one nuke plant generates? All the calcined concrete, the highly-refined steel, massive amounts of energy used to get things there and get it built. When I worked for a research company, we asked the government folk for whom we often worked about finding out if a nuclear powerplant would actually generate the amount of energy it took to build it. They told us if we did the study, we would not ever get another government contract. But my objections are to the real costs, and they are not borne by us, but by all Humans and animals and plants which follow us on Earth - nuclear waste. BTW,when I helped test some safety components of GE BWRs in the late 1970's I thought they were catastrophes-in-waiting. Unfortunately, Fukushima proved it correct. No one has died from radiation. Fukushima is being a deception for fear-mongers like gskam, aside there are much more cases of leukemia/cancer linked to wind/solar than nuclear. ..When I worked for a research company, we asked the government folk for whom we often worked about finding out if a nuclear powerplant would actually generate the amount of energy it took to build it. They told us if we did the study, we would not ever get another government contract..